Welcome to the March 4, 2011 edition of the Carnival of Genealogy. 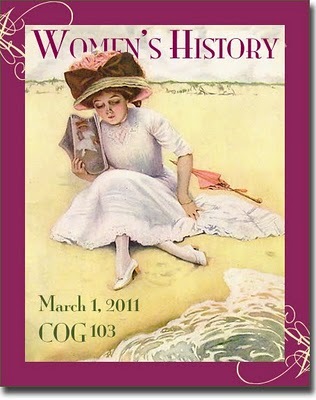 The topic of today's edition is: Women's History! In keeping with March being Women's History Month we are honoring the women in our families and our communities with remembrances in words and pictures. Join us and meet the women we most want to honor and remember. You'll get to know trail blazers, salt of the earth types, and ordinary women who've touched our lives in extraordinary ways. I'm proud to say that this is the 5th year the Carnival of Genealogy has honored women with tributes to them in the month of March. You can read about more incredible women in previous editions of the COG, 2007, 2008, 2009, 2010. We are making the women of our lives live on in words and pictures for as long as the internet lasts, and perhaps beyond. Spring is knocking on the door but the weather is still cold for now. So, our drink of the day is coffee. Pour yourself a big mug and raise a toast to all the women who've poured you coffee over the years. Cheers! Now settle in and prepare for a good read... the Carnival is back in town! Kristin Cleage Williams presents Growing Up - In her Own Words by Doris Graham Cleage posted at Finding Eliza, saying, "My mother tells the story of her childhood in the 1920s and early 1930s. Illustrated with photographs." Dorene Paul presents Aunt Pat, She was Solid as a Rock! posted at Graveyard Rabbit of Sandusky Bay, saying, "Dorene from Ohio recalls her husband's Aunt Pat, who was "solid as a rock."" Janice Brown presents Celebrating New Hampshire Women Through History posted at Cow Hampshire, saying, "For every event in our history books, there were women involved, and usually their participation is not mentioned. It is time for us to be inclusive of women in our histories and genealogies, lest some day we find ourselves left out. In this blog article I present some stories of incredible New Hampshire women." Linda Gartz presents Dress Designer Extraordinaire posted at Family Archaeologist, saying, "Designer and creator of women's clothing, Alöisia Woschkeruscha was ahead of her time." Julie Goucher presents Female Genealogy posted at Anglers Rest, saying, "A reflective account of the contribution my female ancestors have made not just to my history, but in general, with some illustrations." Janet Iles presents Elizabeth Fields Love (nee Robinson) - Carnival of Genealogy #103 posted at Janet the researcher, saying, "Janet shares photos and information about her great-grandmother Love who was a special person in Janet's mother's life." Carol presents My Priceless Minnie, Women's History Challenge, COG 103 posted at Reflections From the Fence, saying, "My submission for the 103rd COG is my tribute to my Gramma, Minnie, she was priceless to me." Lisa Wallen Logsdon presents COG 103 - Women's History Month: Ten Generations posted at Old Stones Undeciphered, saying, "Honoring the ladies in my family is easier done through pictures! (And it gives me an excuse to show off my darling granddaughter too!)" Claire Marie presents Thankful Thursday: The True Heroine of my Family posted at mahoganybox.net, saying, "A story of an amazing woman, whose strength, love, and sacrifices molded me into who I am today..."
Ken Spangler presents A Tribute To The Women Who Helped Me Get Started! posted at Beyond Fiction, saying, "A tribute to the women who helped me to get started in my genealogy journey!" Jen Smart presents Dionysia Ansted (1827-1898) posted at Jen's Genealogy Pages, saying, "If one can have a 'favourite ancestor,' this is mine - my great-great-great grandmother Dionysia Ansted (1827-1898)." Nolichucky Roots presents Women's History - Anna's Story posted at Nolichucky Roots, saying, "My grandmother lived a small life in so many ways, yet the journey she took and the choices she made completely changed the lives of her children and grandchildren." Tina Lyons presents The Tragic Life of Sophia Jane Whitmore - COG 103 posted at Tina's Genealogical Wish List, saying, "Thanks for hosting the carnival again this month!" Linda McCauley presents Lucinda's Life - Women's History posted at Documenting the Details, saying, "Lucinda was my great-grandmother and I was only 5 when she died but I can remember visiting her at Wallins Creek." Steve Hayes presents Agnes Green education pioneer posted at Hayes & Greene family history, saying, "A pioneer teacher in New South Wales"
Shelley Bishop presents Memories of an Ordinary Woman posted at A Sense of Family, saying, "My grandmother, Wilma Steele Herrel, never did anything to make the history books. But in many ways, she represents the very special women whose contributions have enriched the fabric of American life." Jasia presents Sweet Caroline posted at Creative Gene. I've long wanted to write a tribute to my Grandma Carrie but I felt like I didn't know enough about her to do an adequate job. I finally decided to just write what I know and go with it. Here's to you, Grandma Carrie! Cynthia Shenette presents Fascinating Ladies posted at Heritage Zen:, saying, "I've been interested in women's history for years. I also love local history, so for this month's COG I offer up a bit of information on eighteen famous and, in one particular case, infamous women with connections to Worcester County, MA." Cheryl Schulte presents A Woman in History - Perpetua posted at Two Sides of the Ocean, saying, "This is an account of a faithful and courageous woman in history who lived her beliefs and died for them." Nancy Messier presents Because of Them I Am. And Without Them I Would Not Exist posted at My Ancestors and Me. That concludes this edition of the Carnival of Genealogy. I hope you enjoyed meeting these women as much as I did! Thanks to all the terrific writers who participated in this edition. You should all be proud of the remembrances you created for the women who've touched your lives. Call For Submissions! The topic for the 104th edition of the Carnival of Genealogy will be: Cars As Stars of Our Family History II! Three years ago, on April 4, 2008, we celebrated the automobile with stories of cars that touched our hearts, made us laugh, made us cry, and best of all made us remember the (mostly ;-) good old days. Whenever I ask people for topic suggestions for the COG I never fail to get a request to revisit the Cars As Stars topic. It was one of the most popular COG topics ever. So on April 4th, the third anniversary, we're gonna do it again! Bring us your stories of your first car, your favorite car, a family road trip, backseat adventures (ooh la la! ;-) , jalopy horror stories... we want 'em all! The deadline for submissions is April 1st. There will be no limit on the number of submissions so bring multiple stories if you have them! Baroom! I can hear the roar of the engines now!! !